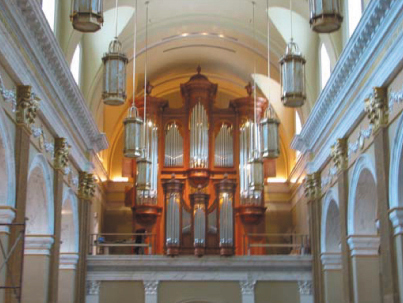 The first of three summer organ recitals at the Shrine of Our Lady of Guadalupe in La Crosse will take place this Sunday, June 10 at 3:00. The recitalist is David Lim, performing works by Bruhns, Cabanilles, Grunenwald, Bach, Shearing, and Vierne. David Lim is a graduate of the University of Iowa where he earned a Master of Arts degree in organ performance studying under Gregory Hand. He served as teaching assistant in the Organ Department, teaching organ and keyboard harmony, and also worked as a research assistant in the Department of Musicology under film musicologist Nathan Platte. Lim complete undergraduate work at Gustavus Adolphus College where he majored in music and biology. His primary organ teachers include Gregory Hand, Chad Winterfeldt, Chad Fothergill, and Jon Naatjes. Lim is presently the Director of Worship and Music at Bethlehem Lutheran Church in Bayport, Minnesota. He formerly served at Ss. Peter and Paul Catholic Church (Mankato, MN) and as organ scholar at First Lutheran Church (St. Peter, MN), amongst other parishes. In 2014, Lim won the Immanuel Lutheran Church Organ Scholar Award (Evanston, IL). In 2017, he was awarded an E. Power Biggs Fellowship from the Organ Historical Society and was inducted to the University of Iowa’s chapter of Pi Kappa Lambda, the national music honor society. The other two recitals for 2018 are July 22: Thomas Fielding, Director of Liturgy and Music at Saint Augustine Cathedral in Kalamazoo, Michigan; and August 12: Kevin J. Vaughn, Director of Music and Organist at Gloria Dei Lutheran Church in South Bend, Indiana. All recitals are on Sundays at 3:00. Admission is free, a freewill offering will be accepted. Come enjoy the beautiful sounds of an outstanding Noack organ in the magnificent Shrine Church. We hope you can join us.